Princess Twilight Sparkle is one of the most magical ponies in the world of My Little Pony, and your best friend! And she wants to show you something – all the new shapes she can assume! Princess Twilight Sparkle has been working hard on her transmogrification abilities, and she’s now going to show you some of the best shapes she can take now! You don’t really have a choice in this. She will get very fussy if you refuse. Sit down and watch! Now! In case you fell asleep from the years of 1997-2007 or were otherwise lucky enough to be spared from the onslaught, Harry Potter is a quasi-beloved fantasy book franchise about a little wizard boy and his little wizard friends. 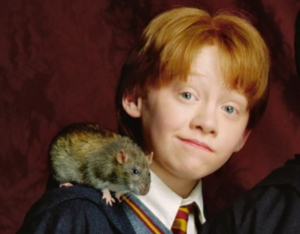 One of those kids is named Ron Weasley, who briefly had a pet rat named Scabbers. Pet rats weren’t very well-regarded by the general populace at this point, but around the release of the film adaptations, quite a few people found the little rat man quite charming and it quite inexplicably became profitable to sell rat-themed merchandise* to wee ones. Then Scabbers turned out to be an old man pretending to be a rat to deceive the children, but that’s not relevant to this article. What we’re talking about today: SCABBERS MERCHANDISE! And uh, Ron too, I guess. *Incidentally, this is an extended advertisement for my upcoming zine, Rat Facts. It’s facts about rats.